Ice cream with pie is great, ice cream IN pie is even better! 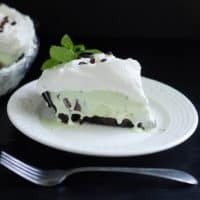 Check out this Fresh Mint Chocolate Chip Ice Cream Pie made with a dark chocolate pie crust filled with homemade mint chocolate chip ice cream. Top the pie with a mound of lightly sweetened cream for a luscious treat. 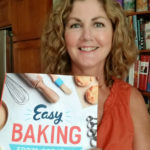 I’ve said it before, but sometimes it’s hard to know exactly what to say about a recipe. 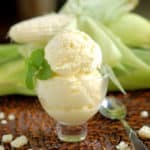 I’ve been writing about ice cream all month so I don’t think I really need to go into the hows and whys behind home made ice cream at this point. 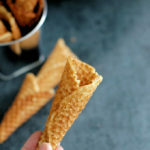 One quick thing I should mention, if you want to flavor an ice cream with spices or herbs that you will extract later, the best method is to steep the ingredient in the hot cream mixture. Kind of like making tea. 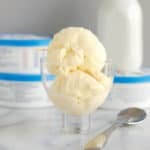 You’ll want to bring the cream/milk mixture up to the scalding point, drop in a big handful of fresh mint leaves, then set it aside so the mint can infuse the cream. I wanted a very fresh mint taste for this ice cream, not the intense mentholated minty flavor you get from extract or oil. I grow mint in my back yard. I plant it in a container because mint can go wild and will take over your garden if you let it. When you walk through a garden center you’ll find all different types of mint. You’ll find peppermint and spearmint, of course, but I’ve also seen chocolate mint, orange mint and even grapefruit mint. I have little self-control when I’m planting herbs so I buy every type of mint they have and plant them all together in a big pot by the back door. But I have to admit, other that a fairly pronounced flavor difference between spearmint and peppermint, I’m not sure I really get a big difference in the flavors of those other mints. Especially once they’re added to foods and drinks. 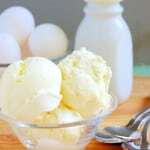 For this recipe I used a mixed bunch of spearmint and peppermint. So I guess this is double-mint ice cream! I added the mint in two steps. First, I steeped half the stems in the hot milk. I removed that mint before cooking the creme anglaise ice cream base. After straining the base, I added the remaining stems to the warm mixture. 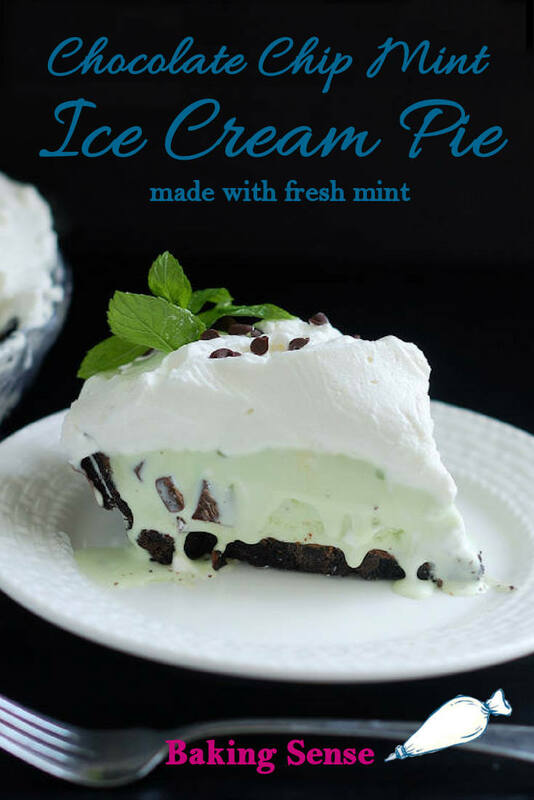 This way the mint can continue to infuse the ice cream as it chills. I did add just a drop of food coloring to suggest the mint flavor. Also, the color is really pretty with the dark brown crust and white cream. If you don’t want to use food color, that’s fine. It’ll still taste nice and minty. 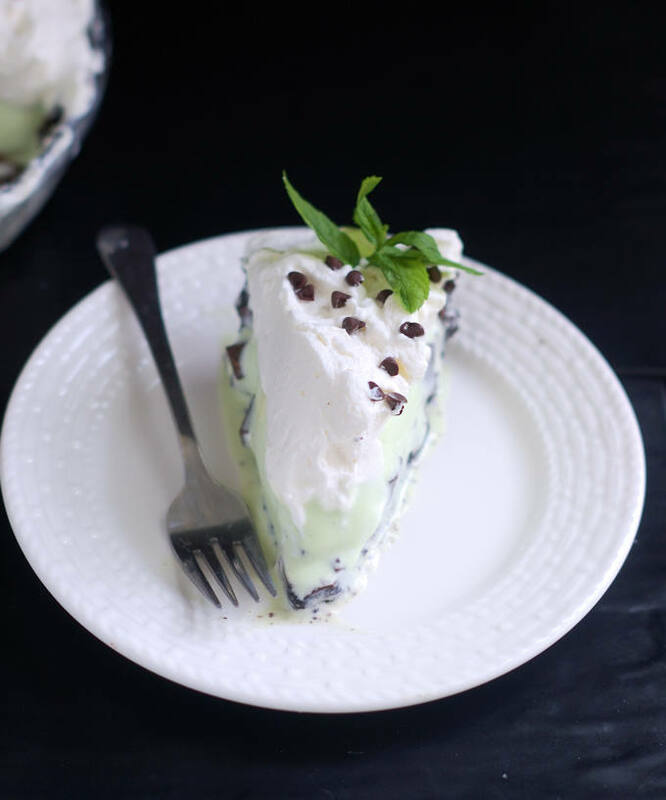 Watch the video to see how to make a Fresh Chocolate Chip Mint Ice Cream Pie. Ice cream with pie is great, ice cream IN pie is even better! 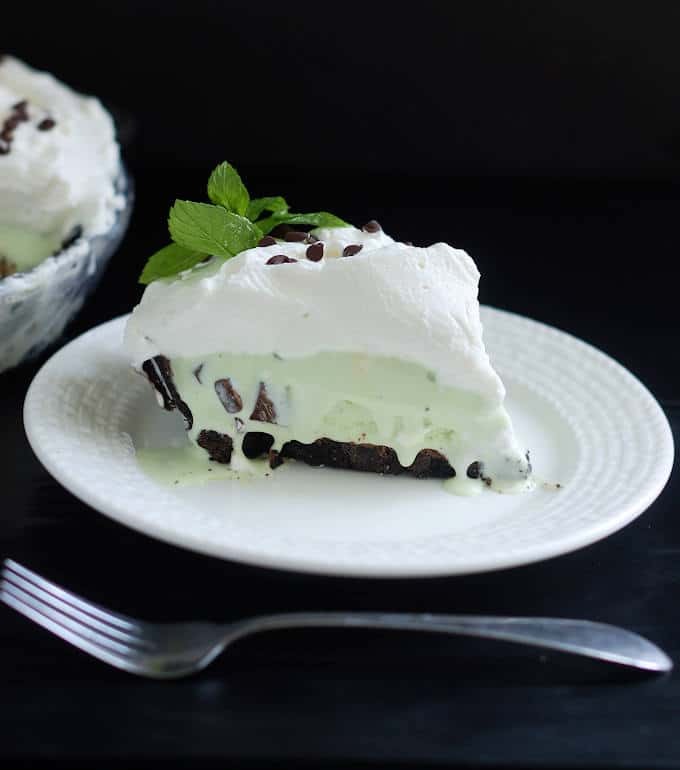 A dark chocolate crust is filled with homemade fresh mint chocolate chip ice cream. Top the pie with a mound of lightly sweetened cream for a luscious treat. Combine the milk and cream in a small saucepan. Heat the milk mixture over medium high heat until scalding hot. Toss in half the mint sprigs, cover the pot and allow to steep for 30-60 minutes. Remove the mint sprigs from the milk mixture. Heat the mixture until scalding. While the milk heats up, whisk together the yolks sugar and salt in a small bowl. Return the entire mixture to the saucepan and heat over medium low heat, stirring constantly. Cook the custard until it thickens enough to coat the back of a spatula or wooden spoon. Do not allow it to come to a full boil. Remove from the heat and strain into a bowl. Add the remaining fresh mint sprigs to the bowl. Cover the bowl and chill until very cold. At least 4-5 hours, preferably over night. Grind the cookies in a food processor. You'll get about 2 cups of crumbs. Add the sugar and butter and pulse a few times to combine. Dump the crumbs into a pie plate. Press the crumbs into the bottom and up the sides of the pie plate. Freeze the crust while the ice cream is churning. 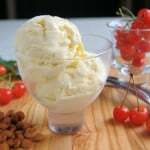 Remove the mint sprigs from the chilled ice cream base and freeze according to the directions for your ice cream machine. Add the food coloring. When the ice cream is ready, toss in the chocolate chunks. 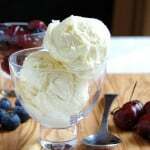 Allow the chunks to mix through the ice cream. When the ice cream is ready, transfer it into the chilled chocolate crust. Cover with plastic wrap and freeze until solid, several hours or overnight. When ready to serve, remove the pie from the freezer. Whip the cream with the confectioner's sugar and vanilla. Spread the cream over the pie. 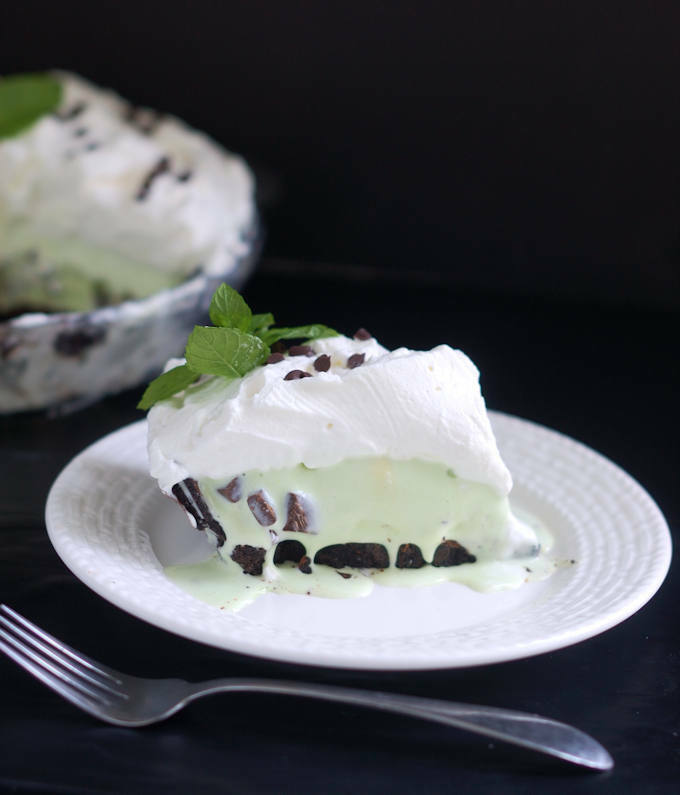 Decorate with a sprinkle of chocolate chunks and a fresh mint leaves. I used one package of Nabisco Famous Chocolate Wafers. Grind the wafers in a food processor to make crumbs. 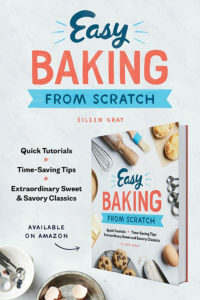 Previous Post: « Easy Baking From Scratch – My book is available for preorder!